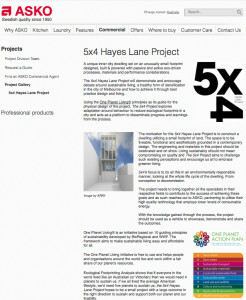 5×4 Hayes Lane Project & ASKO Appliances partner on the project to prove high quality can mean low energy! The motivation for the 5×4 Hayes Lane Project is to construct a dwelling utilizing a small footprint of land. The space is to be liveable, functional and aesthetically grounded in a contemporary design. The engineering and materials in this project should be celebrated and on show. Living sustainably should not mean compromising on quality and The 5×4 Project aims to challenge such existing perceptions and encourage us all to embrace greener living. Bringing together various specialists in their respective fields to contribute to the success of achieving these goals, 5×4 reaches out to ASKO, partnering to explore their high quality technology that employs lower levels of consumable energy.